We’re pleased to announce that we’ve just released a small update to the Admin Console to take advantage of the new theme fragments in the latest release preview of Prism. It’s now possible to upload a file to your theme called login.html or noresults.html which will be displayed on the login page and no results page respectively. If your tenancy has the welsh language option installed, you can upload both English and Welsh versions of these files by adding language codes to the filename, e.g. If you have any comments, questions or suggestions please get in touch; you can comment here, on the forums and Prism Ideas or contact your account manager or the Prism team directly. Following a review of the data suppliers earlier this year, a new deal has been agreed with BDS to provide Prism users with extended enrichments. This will mean that Prism will provide the experience that library users have come to expect from today’s digital environment. The deal will provide a broader range of enrichments as part of the standard Prism offering. These extended enrichments include jacket cover images for books and AV, tables of contents, track listings and long descriptions for books and AV. As part of a Prism release later this year, searching the library catalogue through Prism will produce results where the keyword is contained within the enrichments. For example, searching for a song will return CDs which contain the searched song. The jacket cover images will be available for books and AV shortly. We will let you know when the other enrichments become available in Prism. For more information please contact your Account Manager or libraries-sales@capita.co.uk. 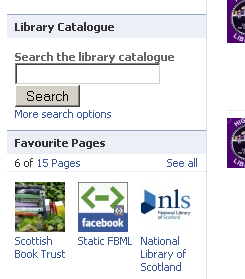 Highland Libraries has a vibrant Facebook page and we were delighted to see th at it now includes a search box to search their Talis Prism 3 catalogue. Highland Libraries has been offering Prism 3 alongside their Prism 2.1 catalogue since early March. a matter of pasting some code into the site page. You can find all you need in a Developer Documentation topic in the Prism Forum. We’d love to hear from other libraries who have done this or who have extended their Talis Prism 3 catalogue in other ways. The Library and systems team at the University of Northampton have this week released their new Talis Prism 3 catalogue to students. They’ve provided a link from the library homepage here and are encouraging students to give them lots of feedback on it whilst they parallel run Prism 2 and Prism 3. The University undertook their own design work and have tied it to the look and feel of the University brand – giving a seamless feeling for students using disparate library services. Mike Aynsworth, Information Systems Manager, told me that “Prism 3 has been configured at the University of Northampton primarily for student resource discovery. We’ve used the Juice project to extend the catalogue to include links to COPAC, Waterstones, Amazon, SFX, Northamptonshire libraries and other useful alternative sources”. The links out to SFX are especially interesting, as the technical team at the University have utilised Juice to point students directly to the full text where it is available, and when not, it takes students to the SFX listings. The team are planning to further extend their alternative resources by adding in direct links to ebooks too. The use of social media is incorporated too, with the option for students to bookmark searches with Delicious. The team are also using the flexible design of the user interface to cater for the OPAC machines actually within the library, allowing for a more locked down “kiosk mode”. Since the announcement of the new Google Analytics Talis Training webinar last week, several libraries have already signed up to attend. If you have you recently gone live with Talis Prism 3 and are wondering how to analyse the usage of your new catalogue with a view to optimising your user’s experience, then Google Analytics is a tool that can help you do this. For more information on the webinar, including access to the booking form, please follow the link. As my colleague, Imraz has reported in his most recent update, more libraries are starting to use Talis Prism 3 as either the main search interface or in parallel to the existing interface. A few, like Haringey have taken the plunge in a big way, and simply replaced the ‘old’ Prism 2.1 interface with the much more attractive Prism 3 look. 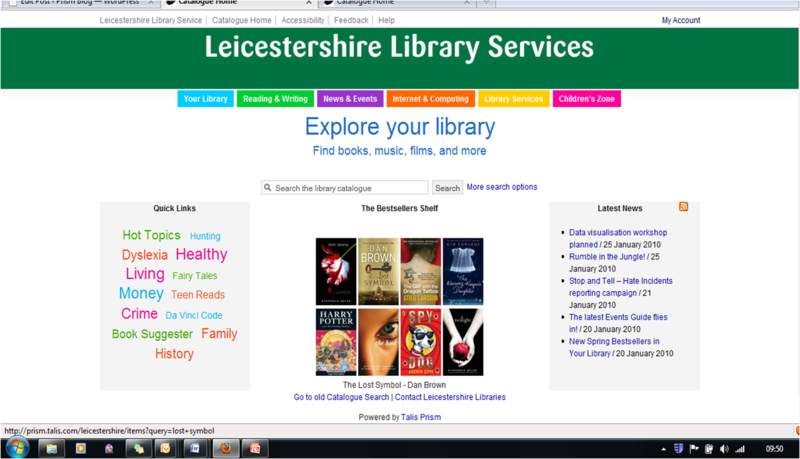 Towards the end of last week I was particularly struck by the latest library to launch their new interface, Leicestershire. Apart from the clean look and feel to the design, attractive book jacket images, and the single search box (all of which are becoming standard on the newer OPACs), I particularly liked the use of the additional information that has been included on the landing page. Firstly, there is the tag cloud which directs users to a “Quick links section”. These links give a highly visual way for users to explore some recommendations, and even a link to Library Thing, via a Book Suggestor. The second area that I thought was interesting was the provision of local library news via a panel on the front page of the catalogue. 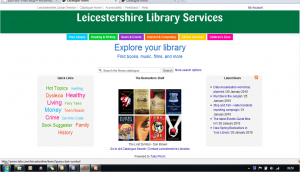 This uses an RSS feed to give users a highly visible way of accessing the excellent Leicestershire Libraries Blog. These additions to the interface are made possible using Juice extensions (for more information about Juice, please see here), and really enhance the look of the catalogue interface, and more importantly, provide users of the library services with the type of value added information that they expect from a website. It will be interesting to see what comments Leicestershire Libraries get from their users about Talis Prism 3. Having used the Google Analytics (GA) application in conjunction with Talis Prism 3 (and Engage) for some time, we asked two of our customers what they thought of the application and what information from GA was being collected and used on a regular basis. 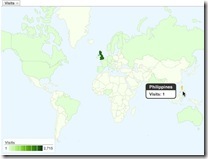 Below are three screenshots showing the different pieces of information that are readily accessible using Google Analytics. Clicking on any of the screenshots will open up a larger image which will enable you to see the details of the report more easily. This first screenshot shows a typical dashboard view, based on our demonstration tenancy, Broadminster, giving a high level overview of items such as the number of visits to the tenancy, the sources of the traffic and a map showing where the visitors are from. 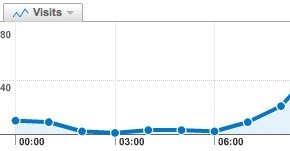 This second screenshot delves deeper into the visitor data and shows the number of people visiting the site over the given time period, how many pages were viewed, and the average amount of time spent on the site. This report also shows which browsers people have used to access the site and a list of the various connection speeds. The third screenshot looks specifically at search terms and details information about the most popular search terms. However, the reports are not limited to just these factors. If the information is recorded, then it can be reported on. Talis Training is also currently working on a training session looking at using Google Analytics to monitor the usage of your Talis Prism 3 tenancy. Further information about this will follow. Talis Prism 3 and Cross Searching. Firstly, a big thank you to all those that attended our webinar on cross-searching multiple databases, your information was very helpful in directing our future plans for Talis Prism 3. From your answers and comments we clarified that there are two key things you want to be able to do with Talis Prism, bring in your local collections and integrate with other, larger collections. Many of you want to be able to direct your users to one or more larger collections such as the British Library or CURL in the event that they can’t find what they need within your collection. In some cases you want to be able to use the information from those collections to generate an ILL request to borrow the material needed. This is a great thing to do as it supports your users in getting access to the materials they need and helps maintain your catalogue’s position as the starting point for any search. Historically this has often been done using Z39.50 federated searching, a library-centric solution that predates the web by many years. To replace this functionality in Talis Prism 3 using Z39.50 would be costly and complex. In Talis Prism 2 the same functionality evolved over a period of several years. Doing the same in Talis Prism 3 would be a substantial cost and would only ever give access to the small number of services that have Z39.50 and that we could reliably configure. A much more common approach today, both for libraries and for other services, is to use the services website directly. On the web generally this is often as simple as a link to the other service. To maintain a more controlled search experience and to allow for the data to be used in ILL requests in future we think it would be better to aim for a more seamless inclusion of those other sites’ searches. A number of you have a strong desire to search a small number of sites as soon as possible and have your own web developers. This is exactly the kind of demand for extensibility that led us to seed the Juice project and there are already people on the Juice project doing similar things. So, if you are one of those interested in connecting your users with the British Library, CURL, Library of Congress or Google Books and Amazon then please Join the Juice project, sign up to the Juice Discussion Group where you will find others, including some of us from Talis, taking advantage of Juice. If you don’t have your own development resource and would like to discuss Talis writing custom extensions for you then please raise that with Alison Kershaw or your account manager. If you have any specific queries about Juice then email Richard Wallis, coordinator of the Juice project. Many of you also have local collections that for a number of reasons are managed outside of your LMS. DS Calm and iBase are common examples and you also talked about electronic serials data. Where the collection, and data about it, are under your ownership and control you expressed that you would like these to appear in Talis Prism searches as part of your whole collection. In many cases the separation of these parts of your collection has been a side-effect of the tools needed to manage the data and is no longer serving your users well, so bringing this data together will be a good thing. Representing different types of asset within Talis Prism 3 is one of the drivers behind our re-working of the underlying data model and that stream of work will facilitate bringing in other collections in future. Look out for it appearing in future issues of the roadmap as we plan beyond our current horizon. Our analysis of these collections shows that the detail of how each collection has been configured and how fields have been used is crucial to providing both appropriate indexing and display. This means that when we reach a position where this data could be brought into Talis Prism 3 there will almost certainly be a need for bespoke consultancy. That consultancy is likely to be needed in order to understand what form the data is in, how you’ve used the product locally and how you want those collections to appear in Talis Prism 3. If you have other local collections, keep an eye on the roadmap and the blog so that when we start looking at this area in detail you know to get involved. The Talis Prism roadmap is available from the Talis Prism site. Those of you have attended recent Prism Events will be aware that the designed for extensibility architecture of Prism enables the integration of optional external services in to the Prism interface to create an even better experience for those that use it. Those benefits are not exclusive to the users of the Prism itself. For instance we have been demonstrating how services such as Google Analytics can give you valuable information and feedback to the library about the use of their tenancy. We recently started a trial with the London Borough of Southwark and The University of Bolton tenancies to assess how Google Analytics can be introduced to Prism. The trial has only been running running for a short time, but already some interesting information is starting to be produced. 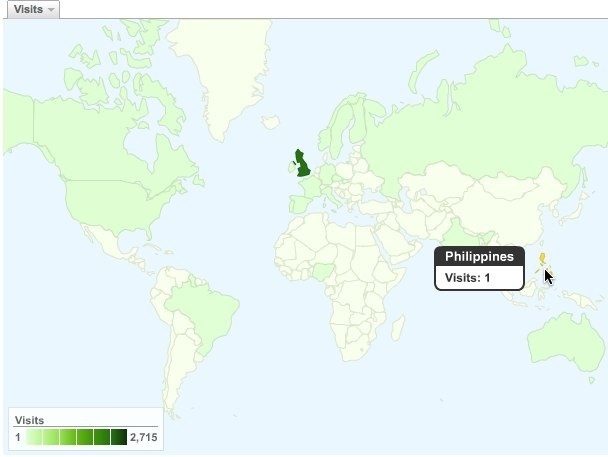 For instance, you wouldn’t have expected to find that a London public library catalogue would be of interest to people as far away as France, Portugal, Czech Republic, Brazil, and the Philippines. Slightly more expected is the fact that students in Bolton are still interested in the library at midnight on a Monday evening. One of the objectives of the trial is to identify any impacts upon the performance of the user interface by introducing calls to external services such as Google Analytics. Care was taken to ensure that the calls are made to the service only once the page had been fully loaded in the users’ browser. It is still early in the trial, but it already clear, by the total lack of comments from library staff and users, that there is no noticeable impact from a user point of view. It is planned for the trial to last a few months, so that we can assess the information and it’s use and work through issues such as the best way to manage Google account logins and the way they are associated tenancies. In the ongoing series of Prism Days I have been demonstrating how the application has been designed to make it easy to extend it’s functionality. One of the example extensions I have been showing is a tool for the translation of the text displayed on any of the Prism screens in to speech to aid access for users with visual problems. With this extension Prism talks to you. The extension is based upon a service from Textic Ltd, a UK based software company. Check out the demonstration in one of the Broadminster demonstration Prism tenancies – click on the ‘Click to Show Text Reader’ icon in the page footer. There is a page in the Prism Developer Wiki that describes the simple steps taken to install it.